Tintern (early spelling Tyndyrn: Fort of the King – perhaps King Tewdrig) is situated in the beautiful lower Wye Valley on the Welsh Marches, the ancient border between Wales and England, in the county now known as Monmouthshire, a territory long disputed between them and hence full of castles and other places of historic interest. It is also an area which saw the beginnings of the industrial revolution of which some preserved traces are still visible. Roman settlement - established at Tintern Parva (Little Tintern, at other end of village from Abbey), remains of river crossing by ford at Fryer’s Wharf by St Michaels church visible at low tide, undergoing archaeological investigation. 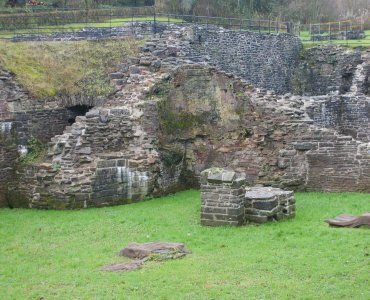 King Tewdrig – 6th c., retired to hermitage in Tintern Parva, but emerged to defeat Saxon invading force in battle nearby. Offa’s Dyke – massive earthwork running for 170 miles along Welsh-English border, built in 8th c., path along dyke passes near Tintern. St Michael’s parish church – built in 8th century on site of earlier Celtic church, rebuilt over the centuries, currently undergoing restoration, Wye Valley Way passes through ancient churchyard, church open to public. Tintern Abbey – founded in 1131 by group of French monks of the Cistercian order, a branch of the Benedictines, closed by Thomas Cromwell in 1536 along with all other monastic foundations in Britain on orders from Henry VIII, buildings granted to Charles Herbert Earl of Worcester and plundered for stone etc, restoration work began in early 19th century, now open as a scheduled ancient monument. The Nurtons – house dating back to 12th c., restored in 19th c., possible site of college founded in reign of Queen Elizabeth by Renaissance philosopher John Dee, now with sculpture garden open to public. Brassworks – established near the ruined Abbey by Queen Elizabeth in 16th c. for production of cannon and wire, shares were held by Herbert Family and Sir Francis Bacon, leading philosopher and Lord Chancellor under James I, produced wire for the first transatlantic cable in 19th century. William Wordsworth – stayed in Tintern 1798 when he wrote one of his most famous poems, Lines Written a Few Miles above Tintern Abbey. Bertrand Russell – born in 1872 at Cleddon Hall a couple of miles above Tintern. Tintern station – opened in 1876 on branch line from Chepstow to Monmouth, closed in 1959 and opened as heritage tourist site in 1986. 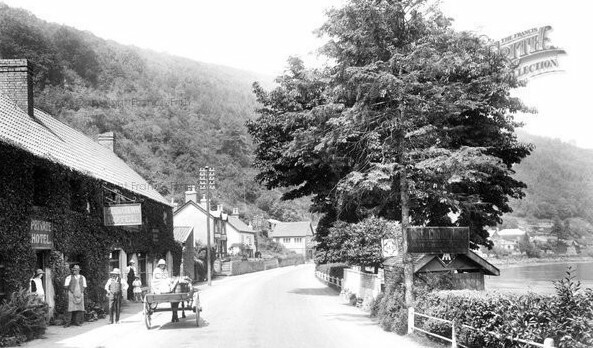 Brockweir – just north of Tintern, once famous for shipbuilding, and for its seven pubs (and no church) which serviced the shipworkers, but ‘saved’ by the arrival of the Moravian Church in 1832, an east European religious group, church open to public. Trellech – a few miles to the West of Tintern, once a major Welsh town, subject to much archaeological excavation in recent times, probably established by the De Clare family for the exploitation of local supplies of iron ore and charcoal to provide weapons and armour, largely destroyed in 1291, and by the Black Death again in 1350, interesting sites include the Harold Stones dating back to the Bronze Age and the Tump Turret dating back to Norman times, and the Virtuous Well a place of pilgrimage and healing since mediaeval times. Symonds Yat – located on the 18-mile long Wye Valley Gorge a few miles above Tintern, favoured by tourists since the 18th century, and much painted by artists in search of the ‘picturesque’. Piercefield House – a few miles to the south of Tintern, dating back to Tudor times, designed by Sir John Soane in the 18th century, now a ruin, set within the 129 acres Piercefield Park, open to the public. St Briavels – situated a few miles to the north of Tintern, castle built in the early 12th century, once an important fortress on the frontier between England and Wales, a royal hunting ground, now a youth hostel. Chepstow – castle began in 1067 the year after the Battle of Hastings, one of the earliest stonebuilt castles in Britain, continued development over the next few hundred years, during the Civil War (1642-48) twice besieged and fell to Parliamentary cannon. Monmouth – King Henry V born here in 1387, bridge built over River Monnow in 13th c. now restored, remains of Benedictine Priory est. 1079, Naval Temple in honour of Lord Nelson’s visit to Monmouth, 1840 Chartist treason trials held in Shire Hall. 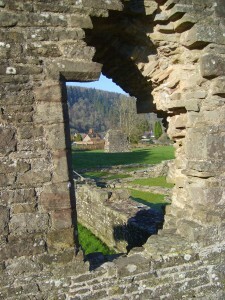 More details about the fascinating history of Tintern can be found in the other pages of this History section.